Ways to apply the psychological ideas of Gestalt to design. Gestalt psychology got its start in the late 19th century. The general idea is that we process information in such a way that we try to find simplicity & patterns in the world around us (even if no such patterns are actually present). Gestalt believes that the whole is greater than the sum of the individual parts. There are a variety of Gestalt principles that describe how our brains tend to think about things, how we take what we see and infer more than what may be there. Designers use Gestalt concepts regularly to solve problems, using some of these cognitive biases to their (and your) advantage. For designers the ideas of Gestalt can be used to more succinctly direct users on how to behave, needing less instructions. For users these same concepts can help us more quickly use digital interfaces as well as find patterns/irregularities in data. The following are a few Gestalt principles and suggestions for how you can use them in both the creation, and the interpretation, of data driven applications. Objects near each other are generally thought to be a part of a group. Text labels very close to input fields are usually thought to be working together because they are close to one another. You should place likeminded things closer to one another to strengthen their relationship. 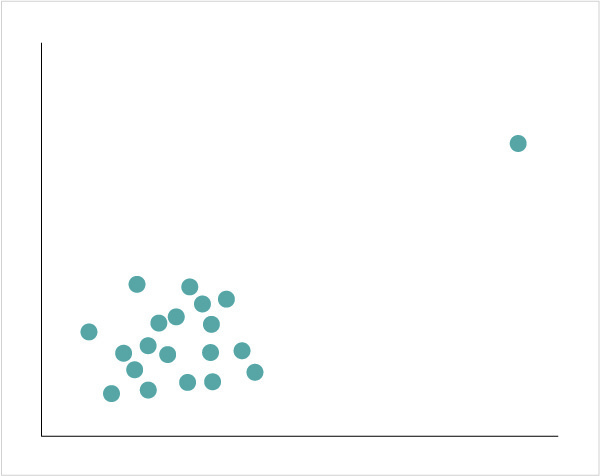 Similarly, Proximity is one of the ways in which outliers in a scatter plot chart are so easily spotted. In the example below most of the dots are clustered to one area of the chart forming a group while the solitary dot outside of this group stands out because of its lack of proximity to the others. We also group things together when they share a property (or properties). Things that are the same shape, color, size, etc. may be grouped together based on that attribute. Interactive buttons should have a consistent style throughout an experience because their visual similarity makes it easier to identify a button when scanning a page. 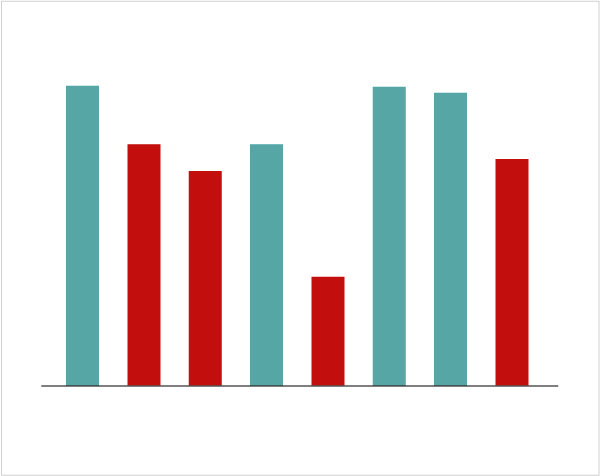 In the example of the bar chart below most people probably see the bars in two groups: blue bars and red bars. This is despite the fact that these bars aren’t necessarily next to one another. Color is an easy way to show another facet in the data while still keeping the chart clean. A word of caution though: too many colors and the cognitive load on the user is too great to benefit from similarity. This is why a few colors in a chart is good, but tens of colors is bad. Common Fate is the idea that something moving along a path will continue along that path. So when a line chart is moving steadily in an upward direction one assumes that, unless some outside agent changes the circumstances, the line would just keep moving that way in the future. In this example from The Simpsons the implication is that disco record sales will just continue indefinitely and the sky is the limit. 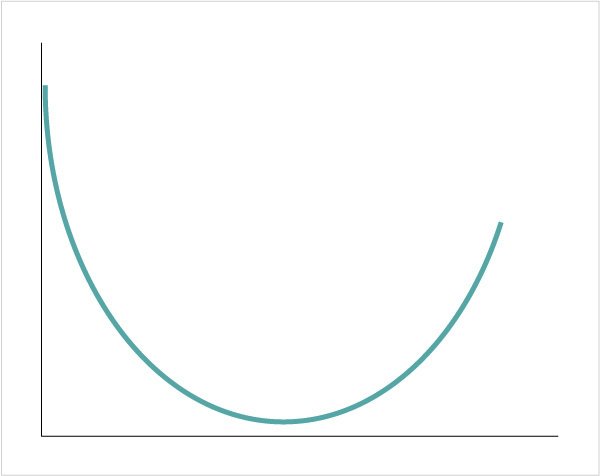 We also make the assumption that in this line chart below, the trend would be to follow the curve upwards. We read the line from left to right and assume that the line will continue on its upward trajectory based on how it started, even though the line could just as likely go down. We tend to view individual objects as part of a larger whole when they are aligned together. A murmuration of starlings is seen as a group as they move/are aligned together in the sky in the same direction. 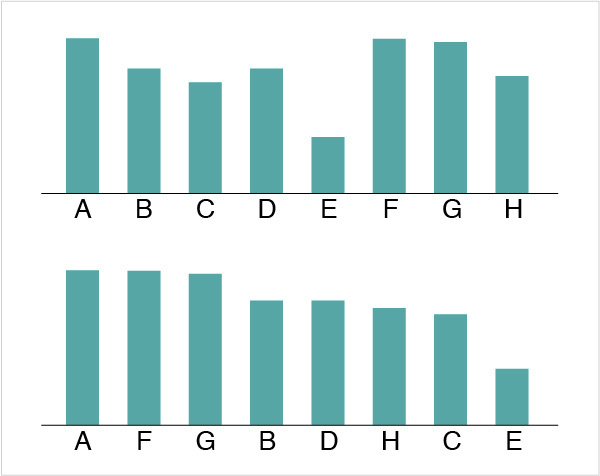 In a bar chart we prefer when the sort order of the bars are aligned in a logical manner. The chart below could have been sorted in alphabetical order (which is logical), but it is more pleasing to view the bars descending in size, sorted by their values. This seems to be a bit of an overarching principle. Prägnanz is a German word that means "pithiness." In Gestalt this is the idea that we tend to group things together if they are arranged in a simple, logical, or unsurprising manner. In other words, we prefer when things are simple and not overly complicated. This has all sorts of design implications, not least of which is the Modernist idea of removing unnecessary ornamentation from your designs. Keep things simple. 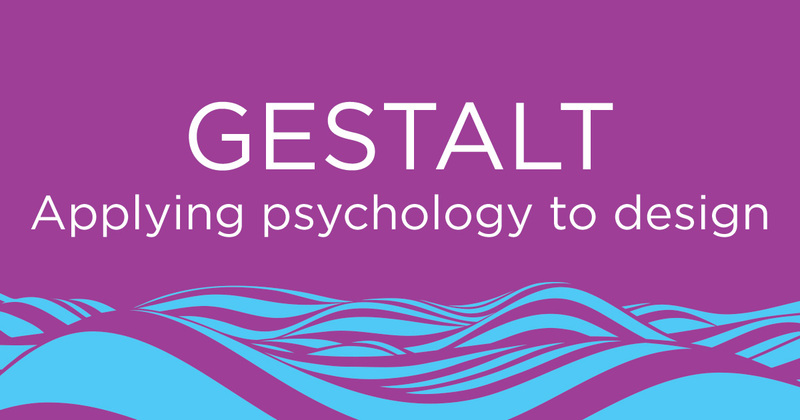 If this has piqued your interest, there is plenty of further reading on Gestalt. Using psychological concepts to better design user interfaces is an excellent interdisciplinary approach to solving problems. Michael Anthony explains how Gestalt principles and suggestions can be used in both the creation, and the interpretation of data driven applications.